So my first year is complete. I passed my second semester with flying colours, to my great joy, of course – (all swotty types like to get that ‘A’ grade), even doing well on the essay. But now a dearth of Cambridge MA happens – a four month stretch until I get back to the soul-food that has become the oxygen in my bell jar. 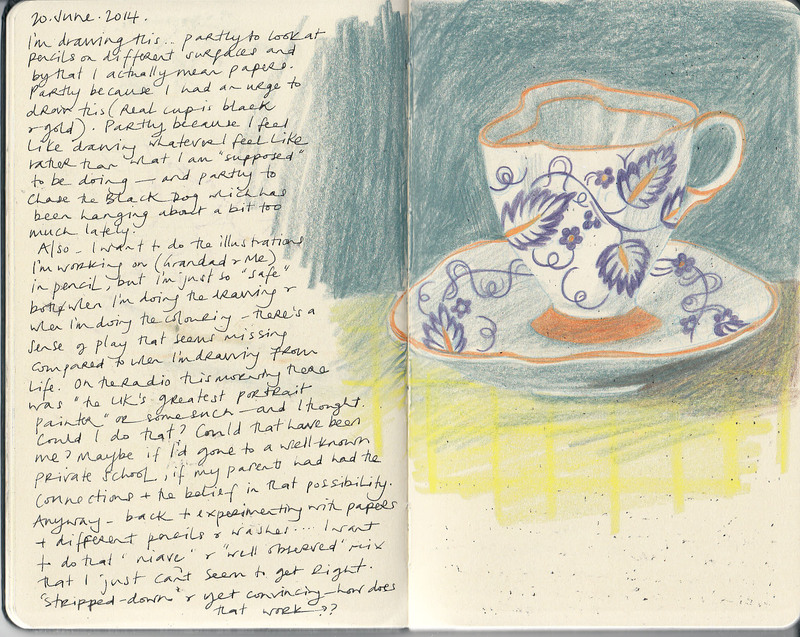 I have not contributed much to this blog in the past few months, mainly because I was working on a story that I didn’t want to share at such an early stage and because alongside that I was drawing in an old people’s home and I think it unethical to share my drawings of the folk there, despite the fact that I would very much like to! Maybe I will see if I can go about getting permission form the relatives because I was really pleased with many of the drawings and the progress I made. It made me realise how much I love to draw people and wonder about whether or not, in another life perhaps, I could be a portrait painter. I also haven’t contributed because I have been developing and attempting to ‘grow’ a business in reportage/live drawing – usually at weddings – and I have been developing a website, a FB page and all that social media Razz-ma-tazz. It’s a real learning curve, and it’s hard work, although it may not look like it. Anyway, the website is here at http://www.eventillustration.com – it’s coming along, but it’s not quite paying the mortgage yet. However, in many ways, it’s all fitting together and I feel like I have a direction and a purpose in my ‘career’. I recognise that you don’t have to be perfect to begin, you just have to begin. The journey, as the title of this blog suggests, is all about improvement, continually learning, and having faith in that process (just in case you were wondering). There still lies doubts, of course – I know I wouldn’t be a genuine illustrator if I didn’t have those – an an A grade is no guarantee of a publishing contract… which is ultimately what I’d like to get one of these days. But it’s the journey that matters and that’s what I keep telling myself. Still, how much harder would it be to believe in that journey if it wasn’t for the approval and encouragement of my tutors and mentors? Having a mentor/s, is such an important thing, and it’s something I’ve never really had. 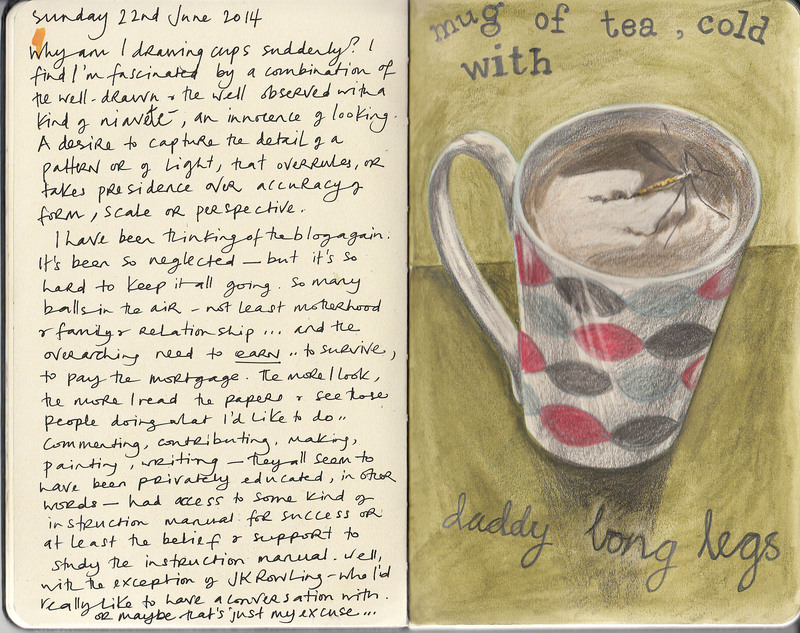 In fact, if you do read the scrawl alongside these cup & mug drawings, you will see the fairly blatant evidence of my working-class ‘chip on the shoulder’, I bang on – or the black dog in my head does – about privilege and private education and blah, blah.. I have to remember how grateful I am at having the opportunity of this course – it’s expensive and paying the loan back sometimes feels me with fear ‘what if my circumstances don’t improve, what if I can’t make this business work’, and then I have to get on with it. I have to draw, and play (it’s hard to remember to do this – but so important for creativity), learn, rest, reflect and experiment. It’s only money, you have to take risks, have faith, and after all, it’s usually what you DON”T do that you most regret. I just had an urge to draw this – so when a crane fly landed in my freshly made mug of de-caff the next day, I had to draw that too… perhaps a theme will develop here? My tea from the evening before… responsible for the death of a daddy long legs.